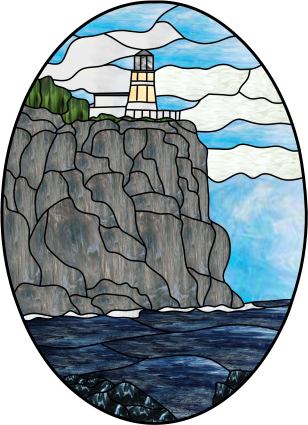 When I saw the Split Rock Lighthouse for the first time, I knew I had to capture it in glass. The lighthouse was built on Lake Superior (the deepest, coldest and most unpredictable of the Great Lakes) in 1910 and was closed in 1969. It is now a historic landmark surrounded by the Split Rock Lighthouse State Park. I was surprised at how easy this pattern came together. When I looked at the site, my eye was immediately drawn to the rocks and water. For that reason, I purposely made the lighthouse less detailed. I wanted the rough rock to stand out amongst the bright sky and dark water. 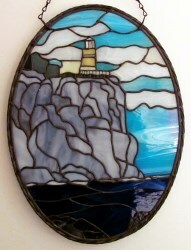 The stunning rocky cliff, with all it cracks and crevices, lends itself to the beauty of stained glass. 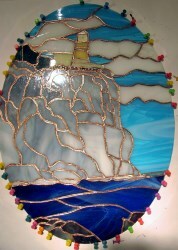 I chose the most prominent features of the rock for the solder lines and let the glass speak for the rocks themselves. After I had it soldered, I used tinned copper wire to bring lines into the big windows at the top of the lighthouse and also to depict the fence along the cliff. If wanted, a person could go farther and use foil to simulate the windows on the outbuildings and lighthouse. I wanted to frame this with something different, so I took ¼" lead H-came, ran that around the edge and tacked it to the glass. Then I took more ¼" lead H-came and put in into a drill and twisted it, wrapping that around the the piece, and centering it into the channel of the lead came. I then tacked the twisted came to the orginal H-came, added the hangers, clean, patina and wax. Throughout the time I've been doing stained glass, I have talked to many people and learned so much from them. Most who have been doing stained glass for decades have very different ideas on how to create a pattern. Some do not like the idea of using software to draw patterns, and feel that you cannot judge things like whether or not a pattern piece may be possible to cut or is simply not a good choice. Additionally, some say that such patterns look like they were made on a computer and do not have the warmth that a hand-drawn pattern does. Personally, I love using Glass Eye 2000. I like that I can put as much or as little detail as I want into a drawing and if I don't like it I can just delete and start over! And what a wonderful thing to be able to "see" what color does to a piece. Granted it's not exactly like the finished product, but a customer can get a very good idea of what color schemes they like and what opaque glass versus waterglass looks like. I have little drawing talent. Even my smiley faces look bad! But with Glass Eye 2000 I can capture the beauty of nature using lines that I can later change, rearrange, duplicate and delete to my heart's content until I finally look at the pattern and say, "Yes! That's it!" Shelly Begg lives in Minnesota and started stained glass around nine years ago. She took a class to learn the finer art of soldering and that was all it took for her to get hooked on glass. She has a small home studio where she designs and produces stained glass art for friends, family and for sale. Shelly and her husband Dave spend as much time as they can at a lake resort in the summertime. Her business is growing, taking up more and more of her time, but Dave has informed her that he is not buying another camper just for her glass work! Her grandkids are even beginning to get the glass bug. She's had help from three of them so far, and her youngest (age 7) recently explained what she wanted Grandma to design for her and the idea turned out very cute. More glass artists in the making! 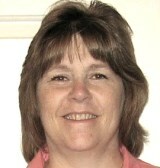 You can visit Shelly's Facebook page or contact her by email.